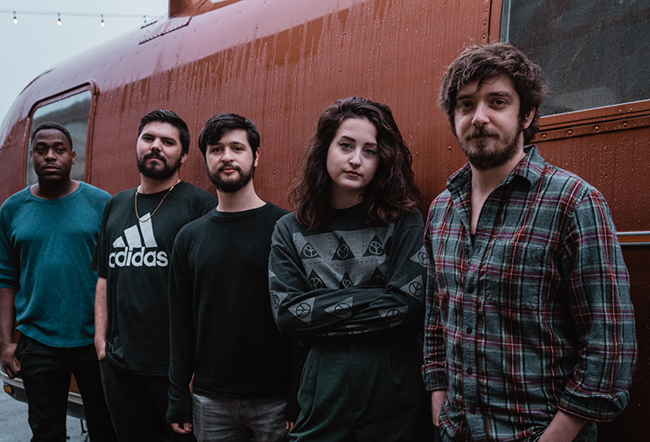 Local post-pop indie rockers Petrov formed in 2018 when guitarists Syd Little and Michael Backlund began writing with bassist Matt McConomy and drummer Garrett Herzfeld. After the group had a handful of songs down, they began the search for a vocalist, and they found a great one in Mary Grace McKusick. McKusick has been doing some writing of her own since joining the band permanently. Her deeply personal lyrics cover everything from relationships, sexuality, sexual assault and manipulation to identity and insecurity. It’s McKusick’s first time in a band, but she’s settling in. Today, the band premieres its new single, “Divine Wine,” the first release from its debut EP, Sleep Year, currently available for preorder. The song is a dreamy rock track that shows hints of Petrov’s ’70s and ’80s inspiration, hammered home by McKusick’s high-powered vocals. Local label Self Aware Records will release the six-track EP on cassette, CD and digital format on March 15. Catch them at Snug Harbor the following day, March 16, at 10 p.m., where they’ll be joined by Pullover, Jail Socks and Patois Counselors. We’ve been keeping our eyes on this band since seeing their amazing performance at Snug in November. They’re one of Charlotte’s most promising up-and-coming acts. Stay tuned for more about Petrov from Queen City Nerve in the lead-up to the Sleep Year release.